In life with kids, some things are guaranteed. The biggest tantrums will happen in public, grandparents will sneak your kids lollies when you’re not looking, and if your kids are into trains, they’ll fall head over heels with Thomas and before long he’ll be their first best friend. From the first time they hear that unmistakeable whistle blow, they’ll fall in love with the world of Thomas. The Island of Sodor has a colourful group of inhabitants including the loveable Thomas and all his friends. It won’t be long till your child is tapping the ABC iview app to watch their favourite episodes as they’ll love learning about the charming world of Thomas. Perfect for kids aged 18 months and up, Rolling Melodies Thomas ($44.99) has interactive buttons, plays music and helps kids develop their fine motor skills. 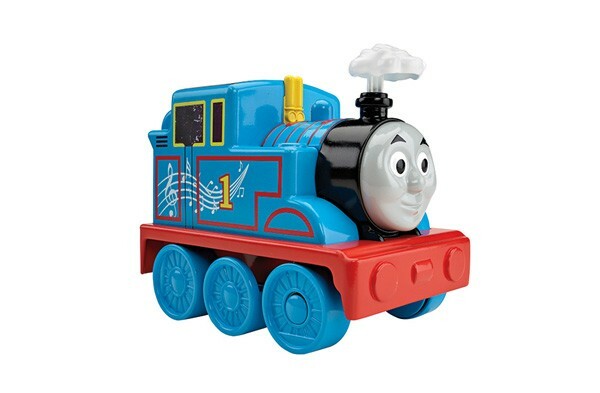 Roll Thomas across the floor to hear his familiar melody or press the boiler bands to hear his voice. The steam cloud plays instrument sounds like piano and the coal bin plays a drum beat that proves you can dance even if you haven’t quite mastered walking yet. The interactive buttons aren’t just about making sounds, they’re about learning too. The sounds play in patterns that kids begin to recognise, and they’ll cycle through to find their favourite beat, tune or phrase. Rolling Melodies Thomas sparks imaginative play, giving a unique personality and voice to the tank engine. Unlock the your child’s inner engineer with My First Thomas Rolling Melodies train. It’s available at Toys R Us, Target and ABC. (This is a sponsored post for Mattel Australia).